If a manager from another planet, attracted by Roger Byrne's exalted reputation, had sent a scout to watch him train there would have been one very confused alien when he perused the report. It might have read something like this: heading - poor; tackling - ordinary; right foot - good; left foot - average (very); general impression - disillusioned. But if that same scout, wary of making too hasty a decision, had decided to stay for a match he would have torn up his notes and advised his boss to beam Roger up without delay. The truth is that Roger Byrne was a superlative performer, one of the most accomplished defenders in British soccer history, but that his game defied detailed and logical analysis. Break his attributes down and he could be made to sound a bad player; but watch him in action and he was a master. He started as a wing-half and was converted to a left-winger, the berth he filled for United reserves. His first game in the number-three shirt for any United side was his Division One debut at Anfield. This was in the Championship-winning season of 1951/52 and Roger was so impressive that he retained that job until six matches from the end of the campaign. 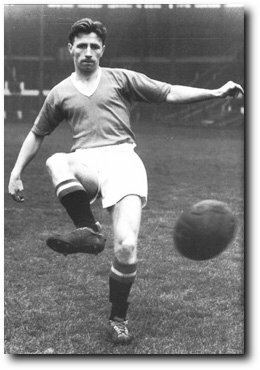 Then, after a couple of defeats, Matt Busby opted to experiment and the newly converted full-back found himself in his former role of outside-left. He responded by scoring seven goals in six games as United romped to the title without losing again. The following season Roger soon reverted to left-back, made the position his own and went on to play the same role for England from his international debut in 1954 until his death at Munich. Roger, who succeeded Johnny Carey as United skipper, was a man who made a nonsense of soccer convention. To begin with he played on the left despite being right-footed. Even more significant was his propensity for attack in an era when most British full-backs thought their place was in their own half and there they must remain. Truly, here was a player ahead of his time. His great asset was speed, both mental and physical. There were few opponents he could not outwit with his inspired anticipation and cool reading of the game, and it was a rare winger - Peter Harris of Portsmouth is the only one who comes to mind - who could make him struggle for pace. Beyond the example he set on the field, Roger was a born leader in every other way. Though only 28 when he died, he was a father figure to the youngsters in the first-team squad. A man of integrity, he had their respect and if at times his tongue could seem sharp they accepted his discipline. Roger Byrne exuded class and charisma. He would have stood out in any company, in any era. A new book following the life and career of Roger Byrne is available. Click here for details.